Seafood Pasta Salad is perfect for summer! Your favorite seafood and tons of fresh veggies are tossed in a zesty dressing with chewy pasta. Easy, filling, and so tasty! 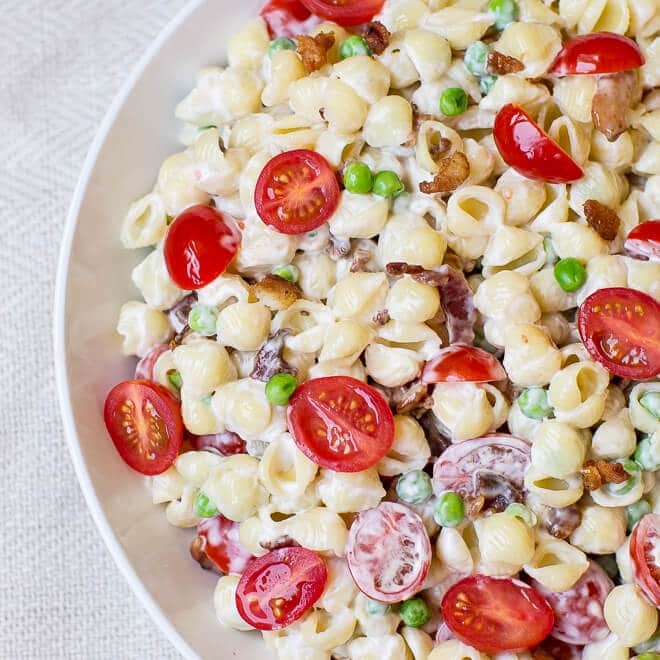 If you’re entertaining this summer (I’m thinking picnics, barbecues, 4th of July parties, graduation parties), get ready for a new Pasta Salad to rock your menu. A big thank you goes out to Kathy, the same Minnesota Mom (and mother of my best friend) that shared her best creamy mushroom soup and her incredible slow cooker turkey breast. Just like those recipes, this Seafood Pasta Salad is pure comfort food…. Summer style. There is something so addictive about biting into a huge forkful of noodles, a creamy dressing, and crunchy vegetables. Add your favorite crab, shrimp, or lobster and people will bypass your main dish for more side dish. I like to pick small noodles for pasta salads because they are easier to eat, especially for kids. Choose one with some nooks and crannies so the sauce and veggies get trapped and every bite has even more flavor. I love homemade dressings, but Kathy’s is too good to pass up. Zesty Italian dressing (such as Wishbone brand) is bright and flavorful when mixed with mayonnaise. If you don’t get excited about bottled salad dressing, simply mix red wine vinegar with the mayonnaise (a great option borrowed from my BLT Pasta Salad). Blanch the broccoli to make it prettier to look at and easier to eat. Then, just mix in your favorite fresh vegetables. I’ve also tried this salad with fresh cauliflower (blanched), green bell pepper, red onion, frozen peas (thawed), and shredded carrots. Use any combination of crab (real or imitation), shrimp, or lobster here. For an easy vegetarian option, omit the seafood entirely. I have also made this salad with chopped cooked ham. I can think of endless options here, so open your fridge and see what you have. The sky is the limit! Any great pasta salad mix-ins you can recommend? I’d love to hear your ideas! Save this Seafood Pasta Salad to your “Side Dishes” Pinterest board! Bring 4 quarts water and 1 T. salt to a boil. 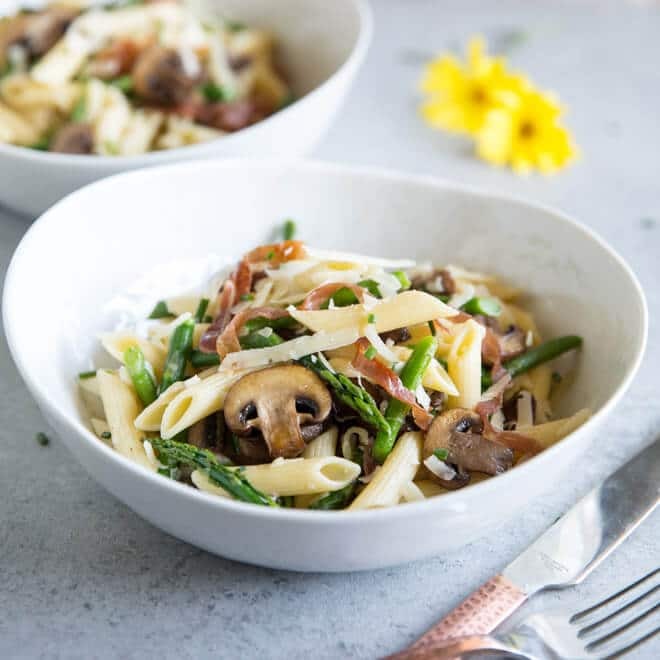 Add pasta and cook according to package directions for firm pasta (1 minute pasta al dente, usually 8 to 12 minutes depending on the exact noodle). Drain well and rinse with cold water. Meanwhile, bring 2 quarts water and 1 tsp. salt to a boil. Fill a medium bowl with cold water and ice. Blanch the broccoli quickly until bright green and tender-crisp, about 3 minutes. Drain and immediately plunge into the ice water to stop the cooking. Drain well. In a large bowl, whisk together mayonnaise, salad dressing, and Parmesan cheese. Stir in pasta, tomatoes, bell pepper, and scallions. Carefully fold in crab and stir until evenly coated. Chill until serving and refrigerate any leftovers. I love seafood, so this pasta salad is calling my name. I’d love to serve it as a tasty side dish for BBQ. Thank you, it’s definitely the time of year for barbecues! Angela, I am so sorry. YOU are not a bother. My recipe has a typo. I am so sorry! My instructions would not be clear to anyone, ever, no matter where they lived. It is supposed to be one pound of small pasta, but I cut out the pound part. And one pound is 453.592 grams. Or thereabouts. :) Thank you for finding this mistake so I can correct it, and I’m sorry again. Take care and if you need anything else just let me know! Sorry!!! Made this yesterday and was delicious!! I do like a little zing so added 1 1/2 tsp. of Salad Supreme!!! Awesome! I love all the recipes y’all have, so good. Hi Meggan, I am excited to try this recipe for a picnic with my fiancé. Any recommendations on what dishes/drinks would pair nicely with it? Thanks for your suggestions in advance! Thanks, Meggan! One last question :) Is the Italian salad dressing dry or wet?